When it comes to sanrio plushes, I am really not exactly easy to please in this category. I think it's one of the major reasons why I don't have too many My Melody plushes in my collection. I realized that I have all big sized plushes of my favorite characters except for My Melody and Little Twin Stars. For LTS, I prefer spending a bundle on a big sized pair rather than spending $60 on a tiny sized or 6 inch plush. I am not sure why Sanrio doesn't make any 28" or 46" plushes for Little Twin Stars. They have done it for Hello Kitty, Pochacco, and Keroppi. 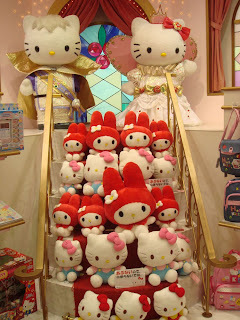 For My Melody plushes, I haven't really found any good designed plushes -- maybe it's because in all of 2008, I have avoided going into a sanrio store that I missed this specific red colored plush. ^ I found this picture online and thought this particular red version of My Melody is really cute. I am disappointed to learn that it's too late to buy one. I visited one sanrio store in Monterrey Park and called up local stores to be told that they don't have any My Melody plushes for sale this season. It would have been a lovely Christmas gift to myself this year. I should comfort myself that I have already done a lot of shopping even if it's online.